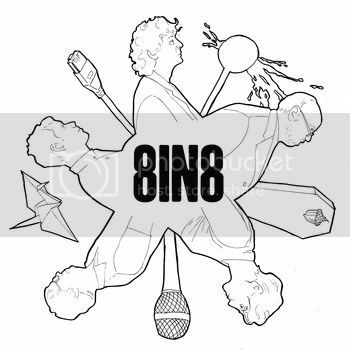 Billed as ‘Tomorrow’s supergroup today’, 8in8 is an impromptu project spearheaded by sometime Dresden Dolls frontwoman Amanda Palmer. Palmer’s dark cabaret works can sometimes be an acquired taste, but amongst the sharp edges and quirkiness, she often demonstrates a fun side. This was never more obvious than on her 2010 EP ‘Amanda Palmer Plays the Popular Hits of Radiohead on Her Magical Ukulele’, which (aside from an occasional appearance of a broken piano) does exactly what it says on the tin. Her work on 8in8’s ‘Nighty Night’ has none of the novelty factor of that EP – nor does it feature a ukulele – and Palmer herself does not appear as harsh or challenging here as perhaps she once did. Also appearing as part of the project are the legendary Ben Folds (who previously made extensive appearances on 2008’s ‘Who Killed Amanda Palmer’), OK GO frontman Damian Kulash and writer Neil Gaiman, who also has the distinction of being Amanda Palmer’s husband. According to Palmer’s online blog, it was Gaiman who contributed the lion’s share of the lyrics to this project. For Ben Folds fans, ‘Twelve Line Song’ is the EPs essential track, as aside from a backing vocal from Palmer, musically, it could easily be a demo of an unreleased Folds number. His bouncy piano work is augmented by a marching drum (also played by Folds), over which his vocals are sparky. In all, despite the unpolished nature, it’s a track which could be better than most of the material from Folds’s disappointing ‘Way To Normal’. As it pulls to a close, the dominant drums and piano line shuffle along with just Palmer’s ‘do do do’ refrain for company. As it ends, if you’re a Folds fan yourself, you’ll undoubtedly want more. If your listening preferences favour Amanda Palmer, ‘I’ll Be My Mirror’ pushes her distinctive vocal upfront on a number which features an even more dominant drum line. The lyrics are hard, concerning a homeless asian woman shouting at her own reflection; a lyric which offers the suggestion that one day it could be any one of us. Palmer’s slightly harsh voice is given suitable accompaniment from crashing guitar chords from Damian Kulash and as far as straighter rock vibes are concerned, it’s one of the EP’s best offerings. The rest of ‘Nighty Night’ is decent, though not quite in the same league as those numbers. ‘One Tiny Thing’ features Kulash’s lead vocal weaved around a very seventies inspired stomp and handclap arrangement. It doesn’t really deviate from its opening groove and after a few listens becomes rather ordinary. ‘Nikola Tesla’ features stabbed piano and a harsh, Lene Lovich style vocal from Palmer. Augmented by Ben Folds on drums and a warm bass line from Kulash, it grabs the attention but is certainly a number for Palmer fans only. This is balanced out by the soft ‘Because The Origami’, a gentle piano duet between Palmer and Folds, whose voices blend rather well. Palmer’s solo voice retains a few ragged edges, but Folds’s piano line remains sympathetic throughout. Closing the EP, ‘The Problem With Saints’ finds Neil Gaiman stepping up the microphone to deliver a very music hall style vocal in a slightly flat, yet charming tone. It shouldn’t work, but is given a lift by Folds’s stabbing piano work, giving way to a almost silent movie esque solo in the centre. It’s certainly a memorable way to end an already quirky release. This six song EP is the result of a plan to write and record eight songs in eight hours as a benefit for the Berklee College of Music in Boston. The fact that it was recorded almost off-the-cuff really shows, as the tracks featured have a great in the studio sound. Although some tracks are better than others, it’s a marvel they all turned out as well as they have, given there was little time for quality control. ‘Nighty Night’ is an unmissable and rather unexpected rough diamond. You can stream or download the EP from the widget below. This entry was posted in alternative, power pop by Real Gone. Bookmark the permalink. Very nice review. It's rather amazing that this EP is the result of 8 hours in a studio.